First, a confession: other than periodic bursts of Super Stickman Golf addiction, I am not what you would call a “mobile gamer” on any consistent basis. I find Twitter and Twitch much more appealing than trying to deal with phone games with sometimes spotty controls on a much smaller screen than I am used to playing with on console games. A second confession: I’ve never played a sports text sim. I did buy Out of the Park Baseball 16 when a mid-season sale put it at a price that put little resistance in the way of my curiosity. I excitedly installed it, took one glance at the mind-boggling number of features, menu items and possible ways to play the game and got overwhelmed to the point of no return. Sometimes — especially without a solid tutorial or walkthrough for new players — there can absolutely be too much of a good thing. I retreated to the familiar cocoon of MLB The Show and didn’t give OOTP a second thought. 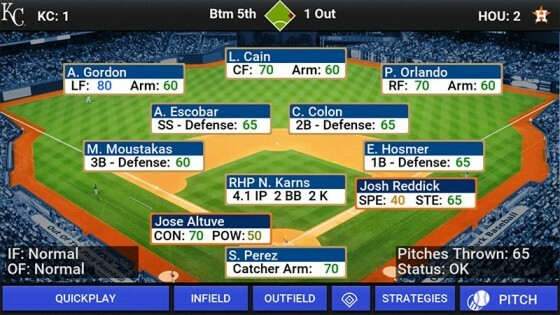 So why, may you ask, am I writing about MLB Manager 17 ($4.99, Apple App Store/$4.49, Google Play) the mobile-friendly MLB text sim from Out of the Park Developments? I’m happy to report that after playing this game for over a week, I have fallen deep into a rabbit hole I don’t want to get out of. For those familiar with the Out of the Park series, it’s important to know that MLB Manager isn’t exactly a port of OOTP to a smaller screen. While there are many similarities between the two games, there are also many differences. Some of the things that make MLB Manager different include a lack of full minor league systems, no in-depth scouting, simplified finances, simplified owner goals, and far less historical information is retained. I can understand why these sacrifices might be annoying for those used to the incredible depth provided by OOTP, but for a mobile game, the options that are present seem to fit the platform. Plus, there is still plenty of information to dig into and analyze, without it ever feeling overwhelming or gratuitous. 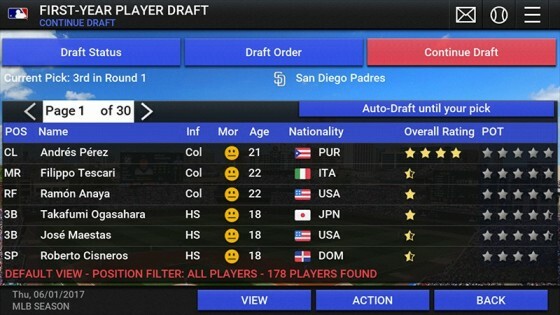 MLB Manager 17 provides three ways to play: current-year MLB, historical MLB seasons that allow you to purchase individual seasons from the past and start with actual rosters and historical statistics from that year, and fictional league, which allows you to create a league all your own, complete with customizable team names and the ability to start with a fantasy draft. Each mode offers its own unique intrigue, challenges and fun. For those who want to act as the on-field manager, MLB Manager 17 provides you the ability to dictate hitter approach and baserunning strategy (steals, hit and run, squeeze plays, etc.) on offense, and pitching approach and defensive alignments on defense. The BNN Live Broadcast will provide text to fill you in on the outcomes of your decisions. The text presentation finds a nice mix of information, character and suspense. There may be a second or two before the text confirms whether that deep fly ball in the corner will be caught easily by the outfielder or end up as a souvenir in the stands. Nearly everyone except the ultra control freaks will want to keep the One Pitch mode option “on” to keep things moving briskly. Off the field, you will be busy handling injuries, player demands, contract extensions, the amateur draft, trade offers and more. The league news section does a solid job of keeping you abreast of transactions, notable performances, major injuries and the rumor mill. If you’re like me and your season isn’t going so well, the “Shop Player Around” feature is helpful to quickly check the trade value of any one of your players. If you find the AI teams to be too stingy with their trade offers, you can change the trade difficulty — and even if the AI prefers veterans or prospects — in the options. The interface has undergone some changes since the previous iteration, and now sports a dark theme that makes it easier on the eyes. On my iPhone 6S Plus, the game runs, navigates and simulates very smoothly. 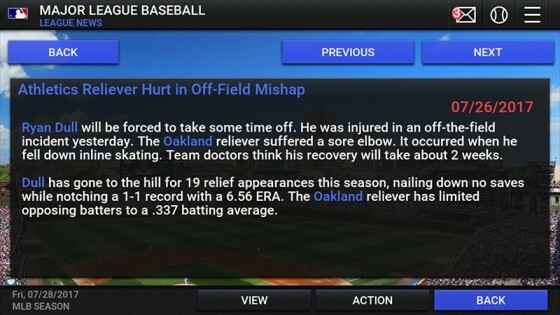 I have read on the OOTP forums and Google Play store some reports of unresponsive buttons that require several presses to respond, but did not experience this at all during my time with the game. For newcomers to text sims or baseball fans who are looking for a fix when they are away from their PS4s and MLB The Show, MLB Manager 17 is a great value at $5. 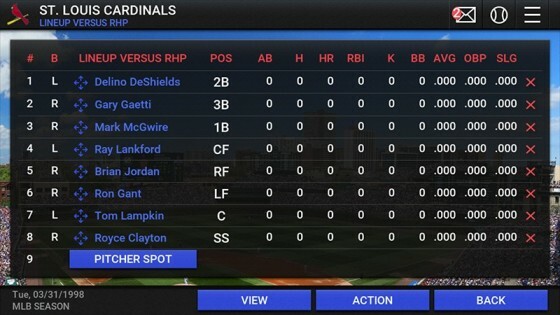 If you already had a previous version of MLB Manager, although the interface upgrade is nice and there are a few tweaks and improvements here or there, it may be best just to keep plugging away with your saves on the previous version unless you are wanting to start anew with updated rosters. For the foreseeable future, any time I am in line at the store, have a few extra minutes on lunch break at work, or am stuck in traffic, my go-to will be to pull out my phone, scroll past the Twitter and Twitch icons, and get in a few more games of MLB Manager 17. Check out the recently released MLB Manager 2017 screenshots.